We believe that the following three are the keys to success in this research area: (1) integration of computational science and computer science, (2) integrative development of various calculation techniques in computational science, and (3) collaboration of computational and experimental materials science. Successful integration of computational science and computer science requires thorough discussions of materials science problems using mathematics as a common language. 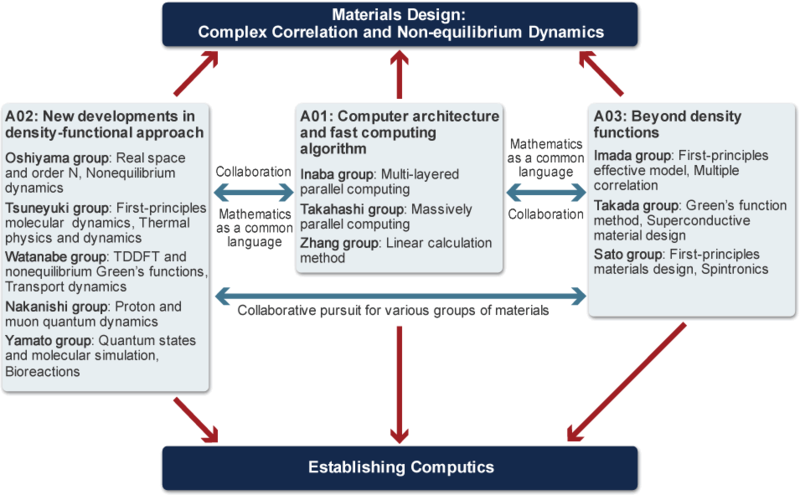 To ensure such discussions, experts in computational science gather in Team A01 to explore the future of HPC by considering the common mathematical structure without being bound by the particularity of an individual problem in materials science. Additionally, collaborative teams, which extend beyond the borders of traditional disciplines, are formed to address specific individual problems and to improve calculation techniques. Teams A02 and A03 consist of researchers from various organizations. These diverse teams focus on complex correlations and non-equilibrium dynamics using various techniques suitable for each project. Additionally, these collaborations within a research project promote the development of new calculation techniques. Furthermore, during the first fiscal year of a research project, experimentalists are appointed as liaisons. These joint efforts ensure that the calculable and measurable targets in computational science are consistent with experimental research projects that will be publicly solicited in the next fiscal year.